Palestinian President Mahmoud Abbas has called on militants in Gaza to cease their "absurd" rocket attacks on Israel as they were impeding peace efforts. He also condemned Israeli retaliatory air strikes, which on Thursday evening hit a building near the home of Prime Minister Ismail Haniya, of Hamas. Earlier, more than 30 senior Hamas officials were detained by Israel in overnight raids in the West Bank. 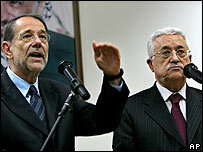 The EU foreign policy chief, visiting Mr Abbas, also called for calm. Speaking in Gaza, Javier Solana said both sides must end the current violence. Mr Abbas said he was working with Palestinian factions to stop the firing of Qassam rockets on Israel. He also said he was working for a "mutual truce" in the Gaza Strip that could be extended to the West Bank. Palestinian officials said an Israeli air strike shortly after midnight on Friday hit a small building used by security guards near Mr Haniya's home in the Shati refugee camp. Israel denied that the prime minister's home was the target of any attack. Several other air strikes were reported, but no-one was reported killed. Earlier on Thursday, Palestinian Education Minister Nasser al-Shaer, three lawmakers and three mayors were among the 33 Hamas officials taken by the Israelis. Mr Shaer's wife Huda said soldiers knocked on the door of their home in Nablus and took him away, simply telling her that they had orders to do so. Mr Shaer, who served as deputy prime minister in a previous cabinet, was also detained in an Israeli round-up of Hamas members in August last year and released the following month. Similar Israeli raids against Hamas last year sparked international outcry. Israel says that the detentions in the West Bank are part of an effort to bring a halt to the rocket attacks. Meanwhile, Israel has carried out further air strikes in the Gaza Strip. In the latest attacks they targeted two empty Hamas buildings - one in Gaza City and one in Deir al-Balah in the centre of the Gaza Strip. Palestinian medical officials say six people were injured in the attacks. More than 30 Palestinians, at least 11 of them civilians, have died in the Israeli missile strikes. The BBC's Aleem Maqbool in Ramallah says the Israeli strikes have failed to stop the intensified Palestinian rocket attacks, with yet more taking place on Thursday. One Israeli civilian was killed and 16 wounded by rockets fired into Israeli border towns, particularly Sderot, in recent days.